Adams Media Corporation, 9781598694710, 231pp. When a child believes he is bad, he behaves badlyand parents react badly, which will only reinforce the child's belief that he is bad. But confident parents can break this cycle and improve their child's misbehavior, says child development specialist Bonnie Harris. Using Harris's eight parenting principles designed to help children succeed, parents will learn the following truths: my child wants to be successfulbehavior is the signal to my child's emotional stateinappropriate behavior means my child is having a problem, not being a problemmy needs are no more or no less important than my child'sI accept my child as a competent and unique individualthe behavior I focus on growsI need to say what my child can heargood discipline requires connectionpunishment breaks connection Putting these principles to work allows parents to abandon the typical reward and punishment system of discipline (which alienates child and parent), and replace it with a more compassionate, successful approach that brings parent and child together. 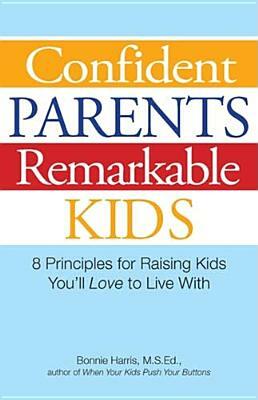 With Harris's plan, parents will gain the confidence and skills to raise remarkable kids they will love to live withand vice versa.